Proper tire inflation will prolong the life of your tires and save you money on fuel costs. With a U.S. 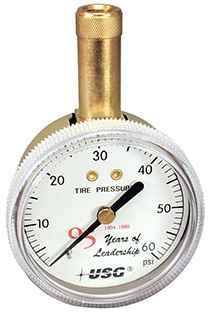 Gauge Tire Pressure Gauge you can ensure that your tires are always running on optimum pressure. Our tire gauge is offered with a brass or chrome finish, and its compact 2” gauge size makes it easy to carry with you wherever you travel. It makes a great gift, and private labeling is available for OEM volumes. A protective rubber boot (#172352A) may be ordered separately.